Introducción: Algunas adipocitoquinas expresadas por osteoblastos, condrocitos y sinoviocitos son responsables de la inflamación y degradación de la matriz extracelular en las articulaciones, generando osteoartrosis. Objetivo: Revisar el estado actual del conocimiento en torno a la relación que existe entre obesidad, adipocitoquinas y osteoartrosis. Materiales y métodos: Se realizó una búsqueda electrónica en las bases de datos de BBCS-LILACS, PubMed, IB-PsycINFO, IB-SSCI, IB-SciELO, Scopus y Science Direct en inglés y español, sin limitar la búsqueda por fecha. 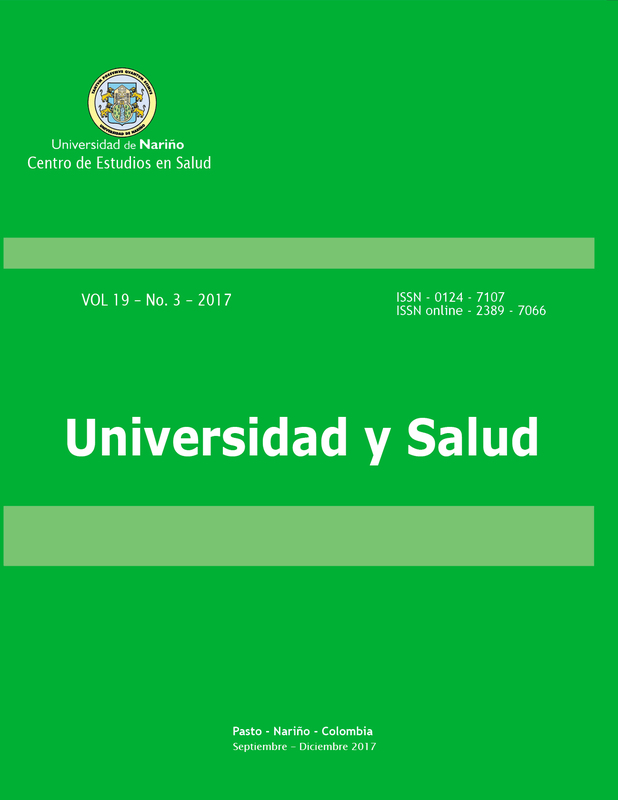 Se incluyeron ensayos clínicos, metaanálisis, revisiones, reportes de casos y artículos clásicos, relacionados con la obesidad y sus implicaciones, osteoartrosis, adipocitoquinas, tejido adiposo e inflamación articular. Resultados: Se encontró 822 artículos, 78 documentos cumplieron los criterios de selección por la pertinencia de la información. El presente trabajo se dividió en tres secciones a saber: osteoartrosis y obesidad, osteoartrosis e inflamación y osteoartrosis y adipocitoquinas. Conclusión: En la actualidad, la obesidad está asociada con el desarrollo de la osteoartrosis, ya que se desencadena una serie de procesos inflamatorios mediados por las adipocitoquinas. Varios estudios recomiendan el desarrollo de investigaciones clínicas para entender el comportamiento de las adipocitoquinas antes y durante el desarrollo de la osteoartrosis. Estudios: Enfermero Profesional, Estudiante de X semestre de derecho. Berenbaum F. Osteoarthritis as an inflammatory disease (osteoarthritis is not osteoarthrosis). Osteoarthr Cartilage. 2013;21:16-21. Poole AR, Guilak F, Abramson SB. Etiopathogenesis of Osteoarthritis. En: Moskowitz RW, Altman R, Hochberg M, Buckwalter J, Goldberg VM. (eds) Osteoarthritis: Diagnosis and Medical/Surgical Management. Philadelphia: Lippincott Williams & Wilkins; 2007. Racine J, Aaron RK. Pathogenesis and epidemiology of osteoarthritis. R I Med J.2013;96(3):19-22. Loeser RF. Age-related changes in the musculoskeletal system and the development of osteoarthritis. Clin Geriatr Med.2010;26:371-386. Bijlsma JW, Berenbaum F, Lafeber FP. Osteoarthritis: an update with relevance for clinical practice. Lancet.2011;377:2115-26. Lago R, Gomez R, Otero M, et al. A new player in cartilage homeostasis: adiponectin induces nitric oxide synthase type II and pro-inflammatory cytokines in chondrocytes. Osteoarthr Cartilage. 2008;16:1101-9. Lago F, Dieguez C, Gomez-Reino J, et al. The emerging role of adipokines as mediators of inflammation and immune responses. Cytokine Growth Factor Rev. 2007;18: 313-25. Lotz M, Martel-Pelletier J, Christiansen C, Brandi M-L, Bruyère O, Chapurlat R, et al. Value of biomarkers in osteoarthritis: current status and perspectives. Ann Rheum Dis.2014;90(1061):171-8. Berry PA, Jones SW, Cicuttini FM, Wluka AE, Maciewicz RA. Temporal relationship between serum adipokines, biomarkers of bone and cartilage turnover, and cartilage volume loss in a population with clinical knee osteoarthritis. Arthritis Rheum.2011;63:700-7. Berner HS, Lyngstadaas SP, Spahr A, Monjo M, Thommesen L, Drevon CA, et al. Adiponectin and its receptors are expressed in bone-forming cells. Bone.2004;35:42-9. Hochberg MC. Osteoarthritis: Clinical Features and Treatment. In: Klippel JH. (ed) Primer on the Rheumatic Diseases. Atlanta: Springer; 1997. McNulty A, Miller M, O’Connor S, Guilak F. The Effects of Adipokines on Cartilage and Meniscus Catabolism. Connect Tissue Res.2011;52(6):523-533. Grotle M, Hagen KN, Natvig B, Dahl FA, Kvien TK. Obesity and osteoarthritis in knee, hip and/or hand: an epidemiological study in the general population with 10 years follow-up. BMC Musculoskelet Disord. 2008;9:132. Panel de Expertos de la Sociedad Española de Reumatología (SER). Primer documento de consenso de la Sociedad Española de Reumatología sobre el tratamiento de la artrosis de rodilla. Reumatol Clin. 2005;1:38-48. Leach RE, Baumgard S, Broom J. Obesity: its relationship to osteoarthritis of the knee. Clin Orthop Relat Res. 1973;93:271-273. Raynauld JP, Martel-Pelletier J, Bertjiaume MJ, Beaudoin G, Cjhoqette D, Haraoui B, et al. Long term evaluation of disease progression through the quantitative magnetic resonance imaging of symptomatic knee osteoarthritis patients: correlation with clinical symptoms and radiographic changes. Arthritis Res Ther. 2006;8(1):1-12. Jordan KM, Arden NK, Doherty M, Bannwarth B, Biljsma JWJ, Dieppe P, et al. EULAR recommendations 2003: an evidence based approach to the management of knee osteoarthritis: report of a task force of the standing committee for international clinical studies including therapeutic trials (ESCISIT). Ann Rheum Dis. 2003;62(1):145-55. Houard X, Goldring MB, Berenbaum F. Homeostatic mechanisms in articular cartilage and role of inflammation in osteoarthritis. Current Rheumatology Reports. 2013;15(11):375-385. Guilak F. Biomechanical factors in osteoarthritis. Best Practice and Research: Clinical Rheumatology. 2011;25(6):815-823. Abella V, Scotece M, Conde J, López V, Lazzaro V, Pino J, et al. Adipokines, Metabolic Syndrome and Rheumatic Diseases. J Immunol Res. 2014;20(14):1-14. Griffin TM, Fermor B, Huebner JL, Kraus VB, Rodriguiz RM, Wetsel WC, et al. Diet-induced obesity differentially regulates behavioral, biomechanical, and molecular risk factors for osteoarthritis in mice. Arthritis Res Ther. 2010;12:R130. Flegal KM, Carroll MD, Kit BK, Ogden CL. Prevalence of obesity and trends in the distribution of body mass index among US adults, 1999-2010. JAMA. 2012;307:491-7. Adamczak M, Wiecek A. The adipose tissue as an endocrine organ. Semin Nephrol. 2013;33(1):2-13. Sirimi N, Goulis DG. Obesity in pregnancy. Hormones (Athens). 2010;9(4):299-306. Otero M, Lago R, Lago F, Casanueva FF, Diéguez C, Gómez-Reino JJ, et al. Leptin, from fat to inflammation: Old questions and new insights. FEBS Lett. 2005;579:295-301. Sánchez C, Pesesse L, Gabay O, Delcour JP, Msika P, Baudouin C, et al. Regulation of subchondral bone osteoblast metabolism by cyclic compression. Arthritis Rheum. 2012;64(4):1193-1203. Torzilli PA, Bhargava M, Park S, Chen CT. Mechanical load inhibits IL-1 induced matrix degradation in articular cartilage. Osteoarthr Cartilage. 2010;18:97-105. Hopkins SJ, Humphreys M, Jayson MI. Cytokines in synovial fluid. I. The presence of biologically active and immunoreactive IL-1. Clin Exp Immunol. 1988;72(3):422-427. Sanchez C, Deberg MA, Burton S, Devel P, Reginster JY, Henrotin YE. Differential regulation of chondrocyte metabolism by oncostatin M and interleukin-6. Osteoarthr Cartilage. 2004;12(10):801-810. Ding L, Heying E, Nicholson N, Stroud NJ, Homandberg GA, Danping G, et al. Mechanical impact induces cartilage degradation via mitogen activated protein kinases. Osteoarthritis Cartilage. 2010;18(11):1509-1517. Feldmann M, Brennan FM, Maini RN. Rheumatoid arthritis. Cell. 1996;85:307-310. Tong KM, Chen CP, Huang KC, Shieh DC, Cheng HC, Tzeng CY, et al. Adiponectin increases MMP-3 expression in human chondrocytes through AdipoR1 signaling pathway. J Cell Biochem. 2011;112(5):1431-1440. Sellam J, Berenbaum F. The role of synovitis in pathophysiology and clinical symptoms of osteoarthritis. Nat Rev Rheumatol. 2010;6:625-635. Goldring M, Otero M. Inflammation in osteoarthritis. Curr Opin Rheumatol. 2011;23(5):471-478. Coggon D, Reading I, Croft P, McLaren M, Barret D, Cooper C. Knee osteoarthritis and obesity. Int J Obes Relat Metab Disord. 2001;25(5):622-627. Bonnet CS, Walsh DA. Osteoarthritis, angiogenesis and inflammation. Rheumatology. 2005;44(1):7-16. Walsh DA, Bonnet CS, Turner EL, Wilson D, Situ M, McWilliams DF. Angiogenesis in the synovium and at the osteochondral junction in osteoarthritis. Osteoarthr Cartilage. 2007;15(7):743-751. Bliddal H, Leeds AR, Stigsgaard L, Astrup A, Christensen R. Weight loss as treatment for knee osteoarthritis symptoms in obese patients: 1- year results from a randomised controlled trial. Ann Rheum Dis. 2011;70(10):1798-1803. Scotece M, Conde J, López V, Lago F, Pino J, Gómez- Reino JJ, et al. Adiponectin and leptin: new targets in infl ammation. Basic Clin Pharmacol Toxicol. 2014;114(1):97-102. Fantuzzi G. Adipose tissue, adipokines, and inflammation. J Allergy Clin Immunol. 2005;115:911- 920. Gualillo O, Eiras S, Lago F, Diéguez C, Casanueva FF. Elevated serumleptin concentrations induced by experimental acute inflammation. Life Sci. 2000;67(20):2433-2441. Roh C, Thoidis G, Farmer S, Kandror K. Identification and characterization of leptin-containing intracellular compartment in rat adipose cells. Am J Physiol Endocrinol Metab. 2000;279:E893-E899. Dumond H, Presle N, Terlain B, Mainard D, Loeuille D, Netter P, Pottie P. Evidence for a key role of leptin in osteoarthritis. Arthritis and Rheumatism. 2003;48(11):3118-3129. Conde J, Scotece M, López V, Abella V, Hermida M, Pino J, et al. Differential expression of adipokines in infrapatellar fat pad (IPFP) and synovium of osteoarthritis patients and healthy individuals. Ann Rheum Dis. 2014;73(3):631-3. Ryan AS, Pratley RE, Elahi D, Goldberg AP. Changes in plasma leptin and insulin action with resistive training in postmenopausal women. Int J Obes. 2000;24:27-32. Sood A, Shore SA. Adiponectin, leptin, and resistin in asthma: basic mechanisms through population studies. J Allergy. 2013:1-15. Ku JH, Lee CK, Joo BS, An BM, Choi SH, Wang TH, et al. Correlation of synovial fluid leptin concentrations with the severity of osteoarthritis. Clin Rheumatol. 2009;28(12):1431-1435. Conde J1, Scotece M, López V, Gómez R, Lago F, Pino J, et al. Adiponectin and leptin induce VCAM-1 expression in human and murine chondrocytes. PLoS One. 2012;7(12):33-5. Gómez R, Scotece M, Conde J, Gómez-Reino JJ, Lago F, Gualillo O. Adiponectin and leptin increase IL-8 production in human chondrocytes. Ann Rheumatic Dis. 2011;70(11):2052-2054. Krysiak R, Handzlik-Orlik G, Okopien B. The role of adipokines in connective tissue diseases. Eur J Nutr. 2012;51(5):513-528. Jamaluddin M, Weakley S, Yao Q, Chen C. Resistin: functional roles and therapeutic considerations for cardiovascular disease. B J Pharmacol. 2012;165(3):622-632. Otero M, Lago R, Gómez R, Diéguez C, Lago F, Gómez-Reino J, et al. Towards a pro-inflammatory and immunomodulatory emerging role of leptin. Rheumatology (Oxford). 2006;45:944-50. Trayhurn P, Bing C, Wood IS. Adipose Tissue and Adipokines-Energy Regulation from the Human Perspective. J Nutr. 2006;136:1935S-1939S. Li XC, Tian F, Wang F. Clinical Significance of Resistin Expression in Osteoarthritis: A Meta-Analysis. Biomed Res Int. 2014;2014:208016. Steppan CM, Brown EJ, Wright CM, Bhat S, Banerjee RR, Dai CY, et al. A family of tissue-specific resistin-like molecules. Proc Natl Acad Sci USA. 2001;98(2):502-506. Patel L, Buckels AC, Kinghorn IJ, Murdock PR, Holbrook JD, Plumpton C, et al. Resistin is expressed in human macrophages and directly regulated by PPAR𝛾 activators. Biochem Biophys Res Commun. 2003;300(2):472-6. Fain J, Cheema P, Bahouth S, Hiler M. Resistin release by human adipose tissue explants in primary culture. Biochem Biophys Res Commun. 2003;300(3):674-678. Degawa-Yamauchi M, Bovenkerk JE, Juliar BE, Watson W, Kerr K, Jones R, et al. Serum resistin (FIZZ3) protein is increased in obese humans. J Clin Endocrinol Metab. 2003;88(11):5452-5455. Senolt L1, Housa D, Vernerová Z, Jirásek T, Svobodová R, Veigl D, et al. Resistin in rheumatoid arthritis synovial tissue, synovial fluid and serum. Ann Rheum Dis. 2007;66(4):458-463. Garaulet M, Hernandez-Morante JJ, de Heredia FP, Tebar FJ. Adiponectin, the controversial hormone. Public Health Nutr. 2007;10:1145-1150. Oh DK, Ciaraldi T, Henry R. Adiponectin in health and disease. Diabetes Obes Metab. 2007;9(3):282-289. Palomera X, Pérez A, Blanco-Vaca F. Adiponectina: un nuevo nexo entre obesidad, resistencia a la insulina y enfermedad cardiovascular. Med Clin (Barc). 2005;124(10):388-395. Hernández-Valencia M, Zárate A, Galván RE. Concentración de la adiponectina en perimenopáusicas. Ginecol Obstet Mex. 2008;76(8):450-453. Ranheim T, Haugen F, Staff AC, Braekke K, Harsem NK, Drevon CA. Adiponectin is reduced in gestational diabetes mellitus in normal weight women. Acta Obstet Gynecol Scand. 2004;83(4):341-347. Lauberg TB, Frystyk J, Ellingsen T, Hansen IT, Jorgensen A, Tarp U, et al. Plasma adiponectin in patients with active, early, and chronic rheumatoid arthritis who are steroid-and disease-modifying antirheumatic drug-naive compared with patients with osteoarthritis and controls. J Rheumatol. 2009;36(9):1885-1891. Filková M, Lisková M, Hulejová H, Haluzík M, Gatterová J, Pavelková A, et al. Increased serum adiponectin levels in female patients with erosive compared with non-erosive osteoarthritis. Ann Rheum Dis. 2009;68(2):295-296. Honsawek S, Chayanupatkul M. Correlation of plasma and synovial fluid adiponectin with knee osteoarthritis severity. Arch Med Res. 2010;41(8):593-598. Chung CP1, Long AG, Solus JF, Rho YH, Oeser A, Raggi P, et al. Adipocytokines in systemic lupus erythematosus: relationship to inflammation, insulin resistance and coronary aterosclerosis. Lupus. 2009;18(9):799-806. Massengale M, Lu B, Pan JJ, Katz JN, Solomon DH. Adipokine hormones and hand osteoarthritis: radiographic severity and pain. PLoS One. 2012;7(10):e47860. Katsiougiannis S, Tenta R, Skopouli FN. Activation of AMP-activated protein kinase by adiponectin rescues salivary gland epithelial cells from spontaneous and interferon-𝛾- induced apoptosis. Arthritis Rheum. 2010;62(2):414-419. Gómez R, Conde J, Scotece M, Gómez-Reino JJ, Lago F, Gualillo O. What’s new in our understanding of the role of adipokines in rheumatic diseases?. Nat Rev Rheumatol. 2011;7:528-536. Brentano F, Schorr O, Ospelt C, Stanczyk J, Gay RE, Gay S, Kyburz D. Pre-B cell colony-enhancing factor/visfatin, a new marker of inflammation in rheumatoid arthritis with proinflammatory and matrix degrading activities. Arthritis Rheum. 2007;56:2829-2839. Little CB, Hunter DJ. Post-traumatic osteoarthritis: from mouse models to clinical trials. Nat Rev Rheumatol. 2013;9:485-97. Meier FM1, Frommer KW, Peters MA, Brentano F, Lefèvre S, Schröder D, et al. Visfatin/pre-B-cell colony-enhancing factor (PBEF), a proinflammatory and cell motility-changing factor in rheumatoid arthritis. J Biol Chem. 2012;287:28378-28385. Yang S, Ryu JH, Oh H, Jeon J, Kwak JS, Kim JH, et al. NAMPT (visfatin), a direct target of hypoxia inducible factor-2α, is an essential catabolic regulator of osteoarthritis. Ann Rheum Dis. 2015;74(3):595-602.